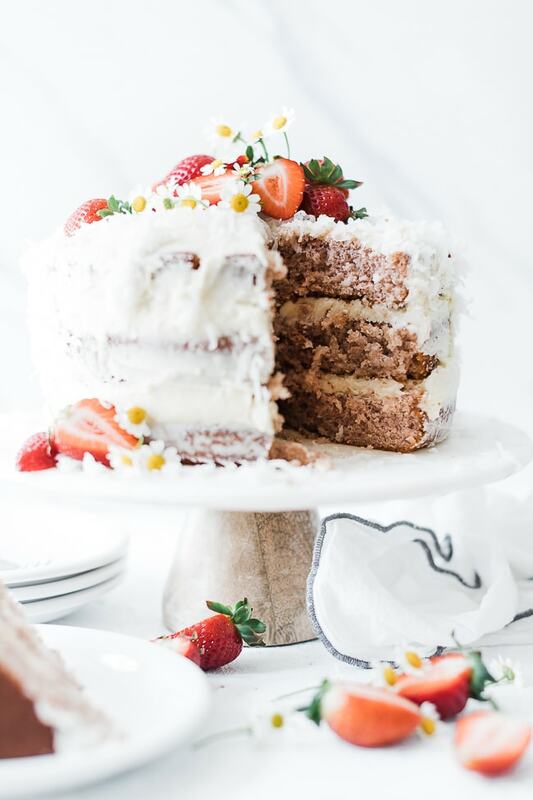 Soft, tender, strawberry cake – layered between creamy coconut cream cheese frosting. 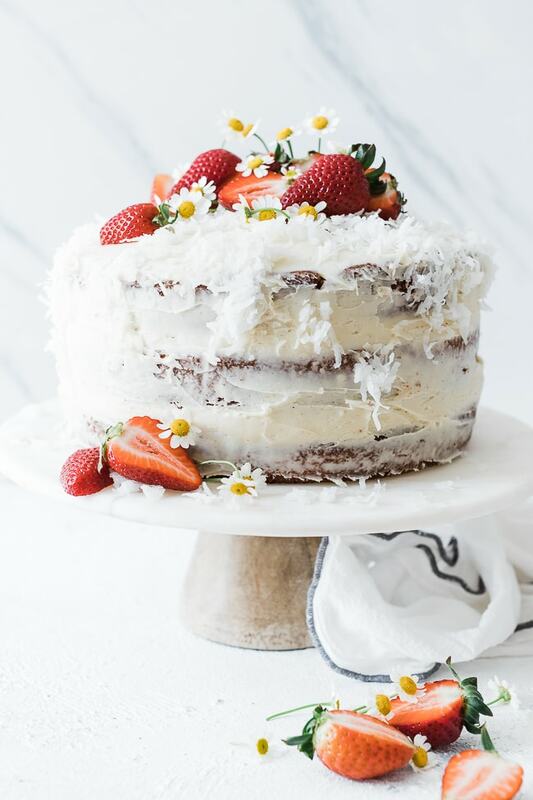 Topped with shredded coconut and fresh strawberries – this Strawberry Coconut Cake is a beautiful celebration dessert. We have all of the tips and tricks to make this cake perfection. For some reason, coconut has been associated with Easter. Does anybody know why? I’m dying to know. Is it because of those super rad coconut Easter bunny cakes my mom used to make? The egg nests? Give me all the Easter bunny cakes and eggs nests. And cadbury eggs. And reese’s eggs. And cadbury eggs. 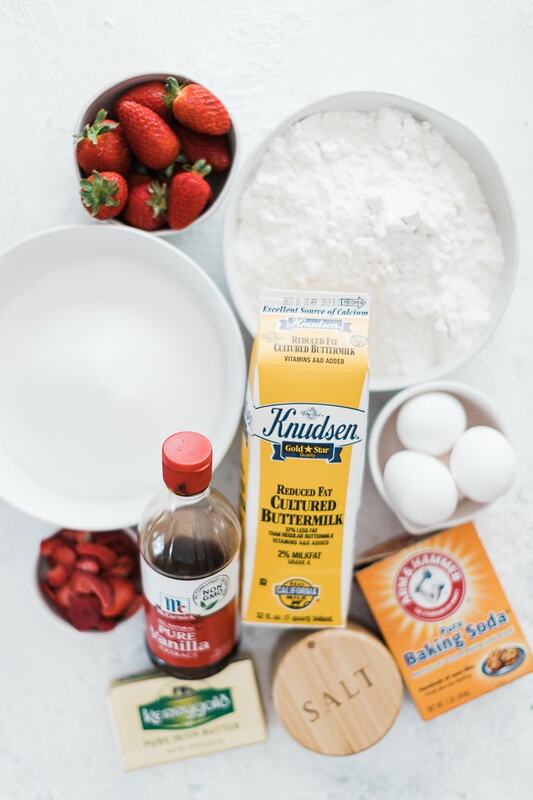 What Do I Need To Make This Strawberry Coconut Cake? Pro Tip – Freeze dried strawberries are readily available at groceries stores. They are found near the raisins and other dried fruit. For this recipe you need egg whites. So separate your eggs and discard the yolks. Allow the whites to sit at room temp for about 30 minutes. Prep your cake pans. 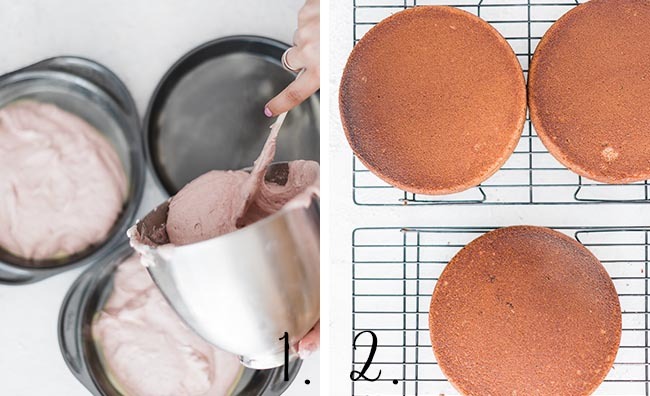 This is a 3 layer cake – so you’ll need 3 – 9″ cake pans. You can grease and flour your pans, or you can use a non-stick spray specifically for baking. 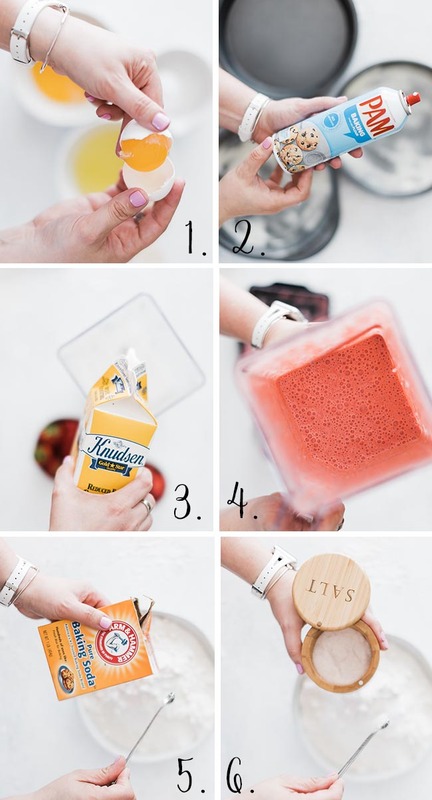 Prepare the strawberry mixture by combining buttermilk, fresh strawberries, and freeze-dried strawberries in a blender. 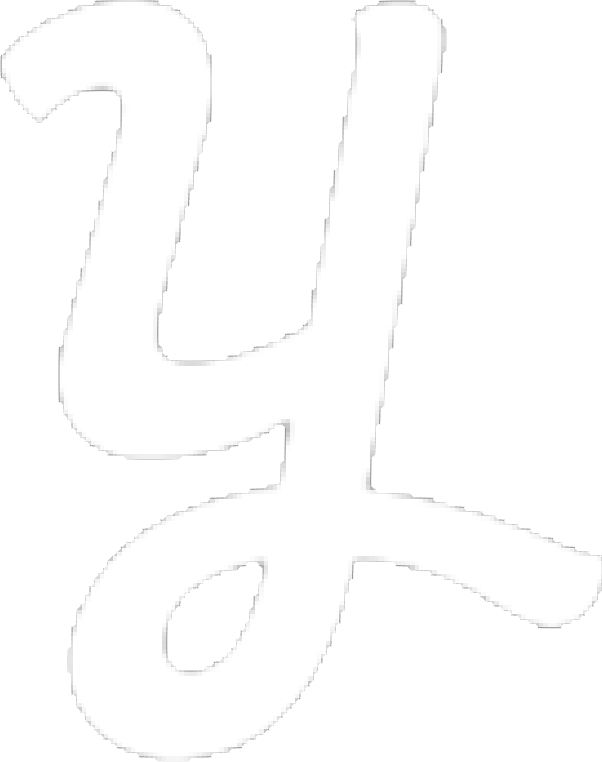 In a medium sized bowl – combine flour and baking soda. Add salt to the flour mixture and stir to combine. Adding salt when baking activates the baking soda. So don’t skip the salt! Whip butter using the paddle attachment of your stand mixer for 30 seconds. Add room temperature egg whites. Beat for 3 minutes. You’ll have a pale, light batter. Add 1/3 of the strawberry mixture. Beat just until combined. Repeat steps 6-8 twice, using the remaining flour and strawberry mixture. Pro Tip: You don’t want to over-mix the flour, which makes a tough cake. I wanted to insert a picture of the final product here, so when you’re in the midst of baking – you’ll remember this beautiful end result. I’m not the hugest fan of baking. I’m impatient. So the waiting for baking, cooling, etc. is always a challenge. If you’re like me – push through. This dessert is gorgeous – and delicious! Divide the batter between your 3 prepared cake pans. Give them a little shake to even the batter. Bake at 350 for 30 minutes, or until a toothpick comes out clean. Let cakes cool in pans for 10 minutes, and then turn over onto a cooling rack and let cook completely. 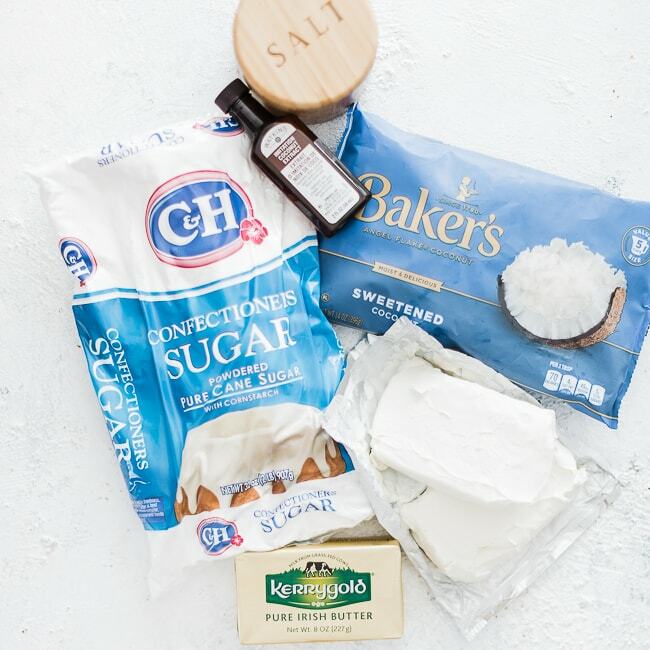 Now Let’s Talk Coconut Cream Cheese Frosting! Whip butter and cream cheese together using your paddle attachment of your stand mixer. Add powdered sugar, vanilla, and coconut extract. 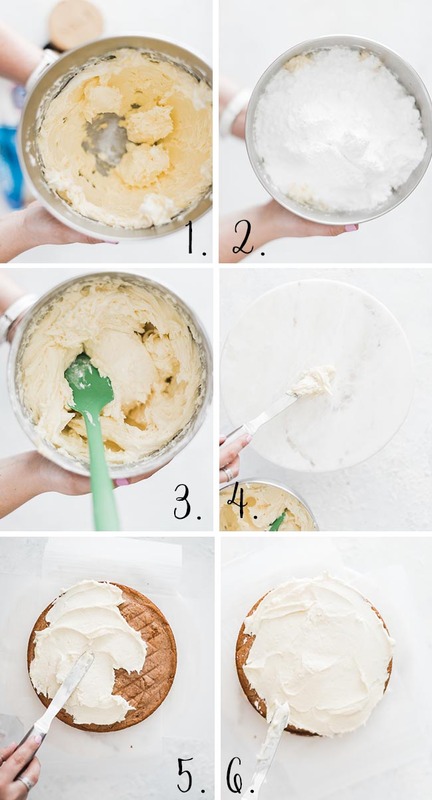 Add about a tablespoon of frosting to your cake plate. This will function as glue and keep the cake from slipping around on the plate. Add one cake round. Smooth a thick layer of frosting on top. Add your second cake and add frosting. Repeat with the 3rd layer. Smooth frosting over the top and sides of the cake. Sprinkle the top with shredded coconut and press coconut into the sides of the cake. Top with fresh strawberries. Perfection. This strawberry cake is very soft with a large crumb. It seriously melts in your mouth. 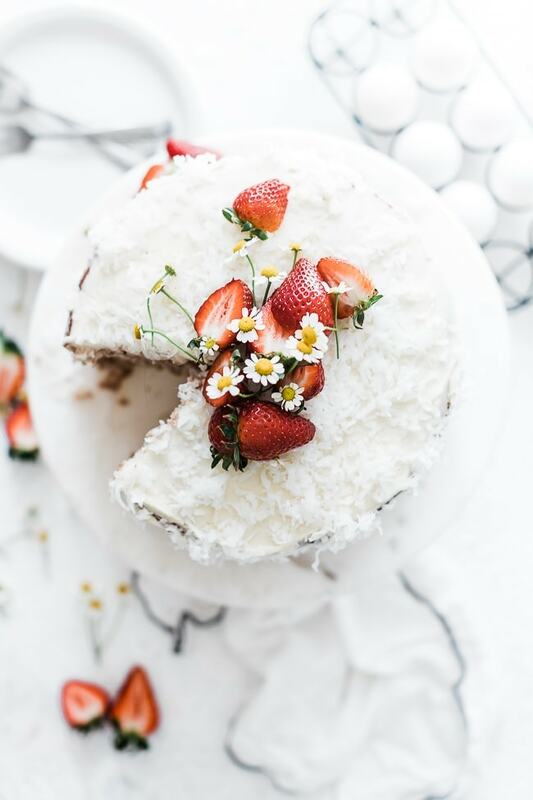 It carries a sweet, strawberry taste that goes perfectly with the coconut frosting. 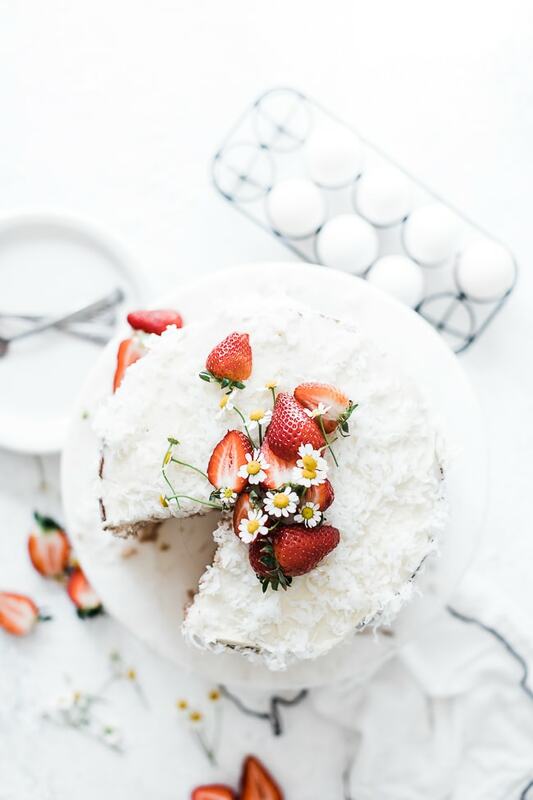 If you tried this Strawberry Coconut Cake or any other recipe on the blog then don’t be shy! Let us know! Rate the recipe and leave us a comment below.  You can also follow us on Facebook, Twitter, Instagram and Pinterest to see what else we’re getting up to! 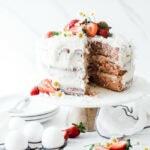 Soft, tender, strawberry cake - layered between creamy coconut cream cheese frosting. 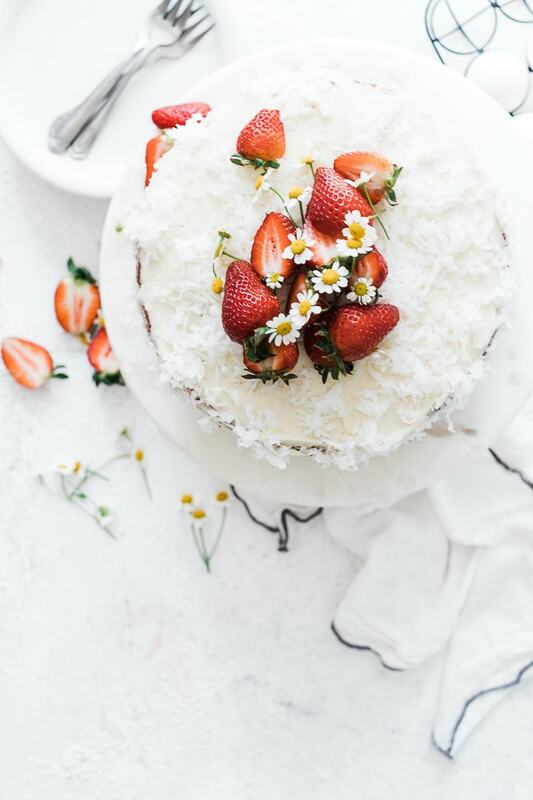 Topped with shredded coconut and fresh strawberries - this Strawberry Coconut Cake is a beautiful celebration dessert. We have all of the tips and tricks to make this cake perfection. Separate eggs. Allow egg whites to stand at room temperature for 30 minutes. Discard yolks. Grease 3 round cake pans (preferably 9", but 8" will work) with shortening, then coat with flour and set aside. Non stick spray used for baking will also work. Blend buttermilk, strawberries, and freeze-dried strawberries in blender until strawberries are mostly smooth. In a medium bowl mix flour, baking powder, baking soda and salt; set aside. Alternate adding flour mixture and buttermilk mixture to butter/egg whites about a 1/3 of each at a time. Beat on low after each addition until well combined. In a large mixing bowl beat butter with an electric mixer on high for 30 seconds. Add sugar and vanilla; beat until well combined. Add egg whites and beat on medium-high for 3 minutes. After baking, Let rest in pan for 10 minutes, then flip over onto cooling rack. To make icing, beat cream cheese and butter with mixer until fluffy. Add remaining ingredients except coconut flakes and strawberries. Frost cake in layers. Use hands to pat coconut flakes onto icing to cover the cake. 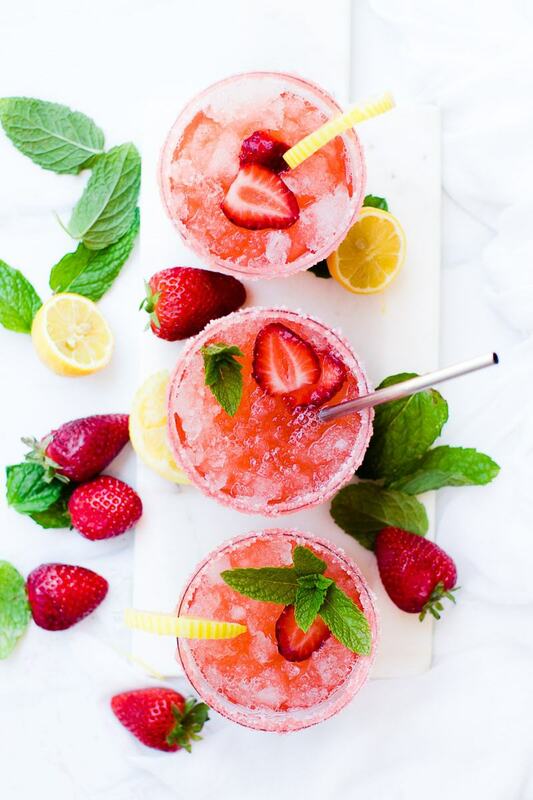 Garnish with strawberries. This looks heavenly! Going to try it out! This looks delicious! I love coconut! And I Love the pretty pink color! I can’t get over how good this cake looks.